Use VHD Mount to mount and edit the contents of VHD virtual hard disk files. 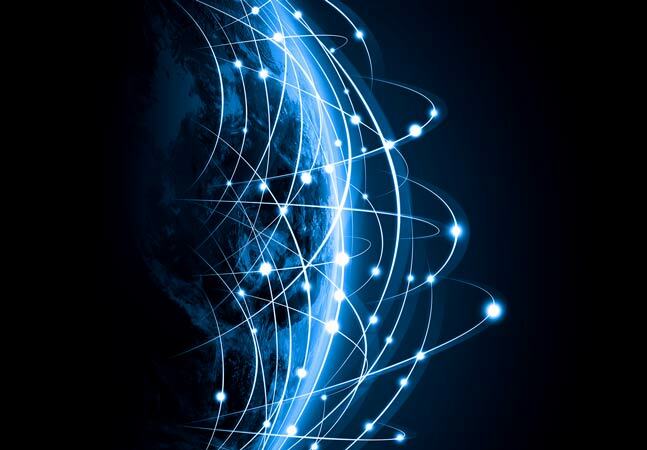 Over the next few weeks, I'm going to be writing about some of my favorite features in the recently released Microsoft Virtual Server 2005 R2 Service Pack 1. This week, I'll start with VHD Mount. VHD Mount is installed by default by the Virtual Server R2 SP1 setup, but can be installed individually, as well. VHD Mount can be installed on any Virtual Server 2005 R2 SP1-supported OS, which includes Windows XP SP2, Windows Vista and Windows Server 2003. 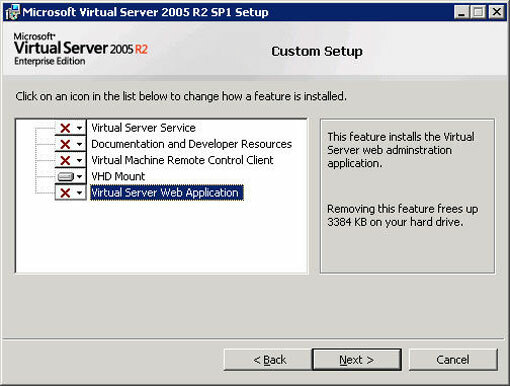 Download Virtual Server 2005 R2 SP1. Once the download completes, run setup.exe from the download location. 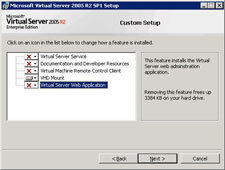 When the Microsoft Virtual Server 2005 R2 SP1 setup window appears, click Install Microsoft Virtual Server 2005 R2 SP1. Click the I accept the terms in the license agreement radio button and click Next. Choose Custom as the setup type and click Next. In the Custom Setup dialog box, click the drop-down menu next to each installation component and select the This feature will not be available option. For the VHD Mount option, click its drop-down menu and select This feature will be installed on local hard drive. The installation options are shown in Figure 1 below. Once you have set the correct installation options, click Next. In the Ready To Install dialog box, click Install. Once the installation completes, you can use VHD Mount to mount any VHD file as a local hard disk. Open the command prompt by clicking Start -- Run, typing cmd in the Run dialog box, and hitting Enter. cd "C:\Program Files\Microsoft Virtual Server\Vhdmount"
Once the VHD is connected, it will be detected like any plugged-in USB drive, so Windows will automatically mount it and assign a drive letter. You can then open the drive in Windows Explorer, and view and edit its files. As you can see, using the /p switch is much simpler and can be run on Windows XP, Vista or 2003, but it does not give you the option to manually assign a drive letter. When you're finished working with the virtual hard disk, you can unplug it by running vhdmount /u D:\XPVM\XP.vhd. 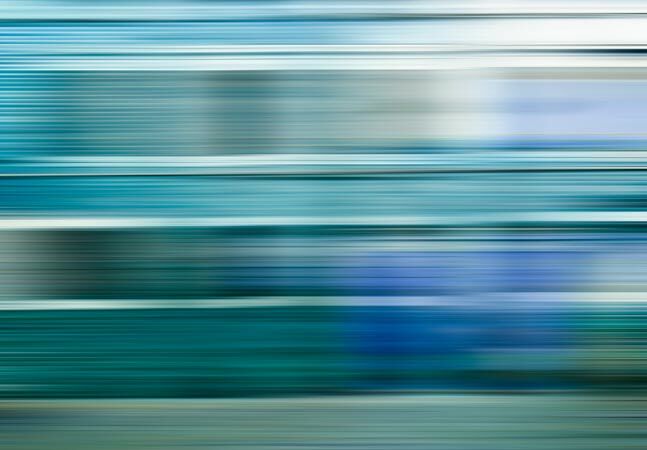 Finally, if you're looking to automatically plug in VHD files when you double-click on them in Windows Explorer, take a look at Ben Armstrong's excellent tip, "Double-Clicking on a VHD To Mount It." 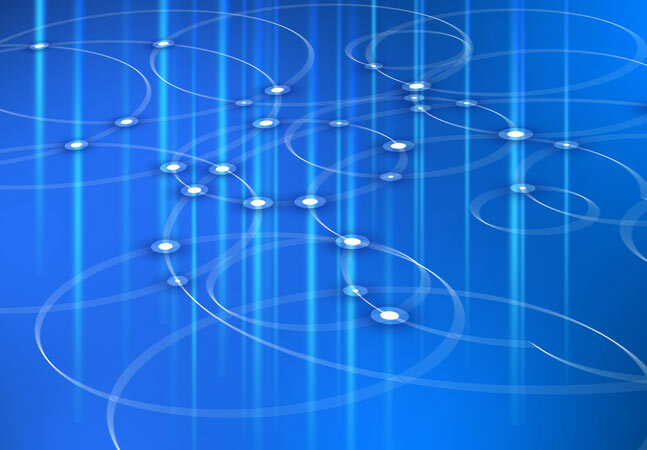 This tip uses the plug-in feature of VHD Mount, so it will work on Windows XP, Windows Vista and Windows Server 2003. VHD Mount is ideal for both auditing and editing the contents of any Windows VHD-formatted virtual hard disk. I hope you find this tool as useful as I have.